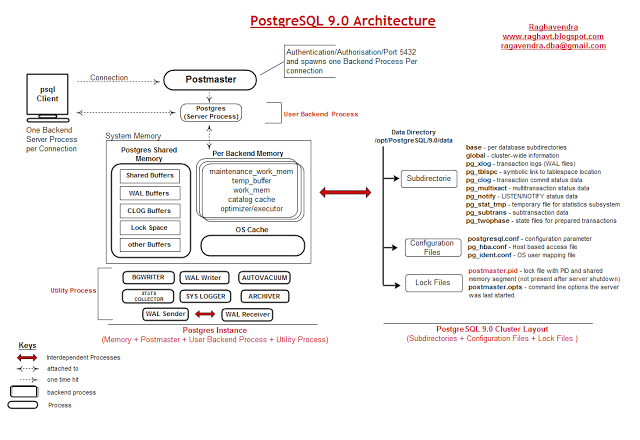 PostgreSQL instance consists of set of Process and Memory. PostgreSQL uses a simple “process per-user” client/server model. PostgreSQL types of process. The ‘postmaster’, supervisory daemon process, ‘postmaster’ is attached to shmmem segment but refrains from accessing to it. However, each backend process is a single-threaded process that can only execute one query at a time; so the communication over any one frontend-to-backend connection is single-threaded. Postmaster and postgres servers run with the user ID of the PostgreSQL “superuser”.